I saw a movie this week in which a character enters a years-unused performance arena caked with dust and cobwebs but decides to use it again for one last show … cut to a montage of people sprucing the place up. I also saw THE MUPPETS. I saw a movie this week in which a children’s-genre character wants to become one of pre-existing group of similar characters. I also saw THE MUPPETS. The former is a reference to THE MUSIC ROOM — and I couldn’t help chuckle at the same scene in a musical fantasy like THE MUPPETS immediately after that powerful tragic drama. Or was I laughing at how that powerful tragic drama used a trope long favored in musical fantasies — “hey kids, let’s fix up the old place and put on a show!!”? The latter is a reference to SMALL FRY, the Pixar “Toy Story”-series short that played before THE MUPPETS. A mini-Buzz fast-food toy escapes from the restaurant, switches himself with the “real” Buzz and joins the rest of the gang. Woody et al aren’t buying that he’s Buzz — the size and voice make the ruse so absurd it’s funny, like a kid pretending to be his dad and expecting mom to buy it. Meanwhile, in the comic heart of the film, Buzz is trapped in a support group for discarded toys (all from previous fast-food promotions of ‘fictional’ movies with probably real-life analogs). These absurd little trinkets sit in a circle and say things like “even though I’ve been thrown away, I am not garbage,” while Buzz is rolling his eyes and saying he hasn’t been thrown away (“you’re in denial”). It doesn’t tread ground Stewart Smalley didn’t, but it’s funny, and the merchandizing parodies are creative, if fish-barrel territory. But the thematic similarity with THE MUPPETS (and … ahem … Kiarostami’s CERTIFIED COPY) was striking; if I were a pretentious frog-philosopher type, I would call it The Issue of the Simulacrum in Post-Modernity. As it is, I’ll say that both the short and the feature grapple with the “copy” problem, if in the specific context of pop-culture familiarity with the original. 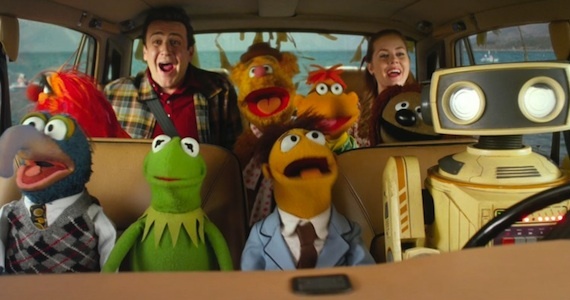 In SMALL FRY, the issue is more existential — what space can a barely-valued knock-off have; while in THE MUPPETS, the textual issue is more the original’s obsolescence decades after its success, and there’s also the critical background question, “why make this movie at all, Jason Segel?” Or why is Victor, a 45-year-old man, watching this movie with no children in tow (I got a weird look when I bought a single ticket to WINNIE THE POOH earlier this year). Both the TV show (I’m told) and the original MUPPET MOVIE, as I argued the other day, were totally self-referential entertainments, which makes it fair and in the originals’ spirit for Segel, as star, writer and executive-producer, to make the film about those very problems. Why get the Muppets back together (in the story) or make a Muppet movie (Segel’s issue), now that they’re obsolete? It also becomes a fair solution to use as the story entree two new “muppets,” Segel’s character Gary and the puppet Walter, supposedly the most identical twins since Danny DeVito and Arnold Schwarzenegger. The issue of “man or muppet” even comes up later, now that the two have grown apart in the obvious physical way. But in the very fact of their Muppet-worship, their disappointment to see the disrepair of Muppet Studios and their determination to get the gang together for one last movie show to foil Evil Nefarious Villain, they become surrogates for an audience that has shelled out $10 or more to watch a Muppets film in 2011 — a new generation for whom Kermit, Miss Piggy and Fozzie are memories, if that, whom we want to see back together. That would be moot if the film weren’t surface entertaining, but it most definitely is. I was bothered by the fact that, even as a non-Muppet boy-fan, I could tell Miss Piggy and Kermit weren’t the same voices, but I forgot about it soon enough.It has fun with its own anachronisms (I lost it at the sound of a dial-up modem) and its self-aware elements — Chris Cooper isn’t gonna win any Oscars for the role of Evil Oil Magnate Tex Richman (“rich man,” get it?) but he does exactly what’s required with rap songs and lines like “maniacal laugh” and plays them utterly straight. So it’s wrong to dismiss THE MUPPETS as mere nostalgia, though nostalgia is definitely its subject, it’s more about the process of realizing a dream, specifically that the elements of Segel’s one’s childhood can be vital and made relevant today. The film also introduces both the difference between good nostalgia and bad nostalgia, in the story of what Fozzie is doing “now” in Reno, and the reason why even the “anachronistic” Muppets might be valuable today, in the TV programmers scenes (#TeamPunchTeacher should join #TeamPunchSimon). Nor is it fair to pick on THE MUPPETS too hard for foregrounding Walter and Gary for the first half-hour, since their relationship is so Muppet-like and that part of the film shares the same sense of humor. It’s absolutely NOT like the “normal” characters in MGM’s Marx Brothers movies, who clearly WERE residing in a different, totally-flat and utterly-uninteresting universe from that of the Brothers. For example, the music number “Everything Is Perfect” is much more sly than its Precisely Too Much on the Nose title, in lines like “Life is like a filet fish” (puzzled look for a rhyme) “yes, it is” and gestures like the whole town collapsing in “glad THAT was over” exhaustion and saying “OK, they’re gone” once Gary and Walter get on a Greyhound bus to leave Smalltown and its FW Woolworth on the square. It’s fun to pretend the world is perfect and everyone can be happy, even while knowing it can’t be; the artificial pretence is the fun. Even if only for the lovers, the dreamers and me. To make one more wack comparison and confirm that this Nostalgia Is Its Own Glory theme is an official Trend, let me also cite 2006’s ROCKY BALBOA, in which the iconic character gets a bid for a last moment of Old School glory against Classless Newcomer (hey, *more* shades of THE MUSIC ROOM). Rocky doesn’t quite succeed but puts up such a good fight that he leaves the ring to the cheers of the crowd before the decision is even announced, the fight’s loser on the books but the winner in everybody’s eyes. Of course, Stallone’s pulling this film off this late in his career means he gets Rocky’s glory-in-defeat reflected back on himself, only as pure glory. Appropriate changes in the proper nouns, that is more or less what happens in the story-conflict of THE MUPPETS.